The Patriots' deal with running back Rex Burkhead is reportedly worth $3.15 million and includes a $1.1 million signing bonus, $1.8 million base salary and $250k in per-game roster bonuses. When the Patriots signed Rex Burkhead on Monday, it initially looked like a replacement for Brandon Bolden, who's a free agent. 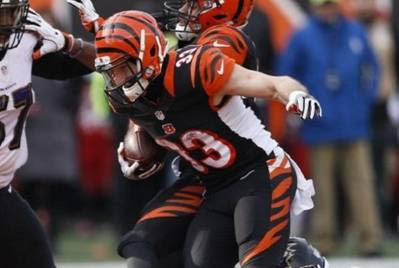 Since Burkhead was a core special teamer and backup running back in Cincinnati, that notion made sense. A look at his contract, however, it looks like Burkhead could be a replacement for LeGarrette Blount. According to ESPN, the Patriots signed Burkhead to a one-year deal worth $3.15 million. The contract includes a $1.1 million signing bonus, $1.8 million base salary and $250k in per-game roster bonuses. To put the $3.15 million into perspective, Burkhead is the highest paid Patriots running back since Fred Taylor ($2,732,280) in 2010. Over the last six seasons, the Patriots haven't paid a running back $2-plus million. Burkhead's $3.15 million cap hit in 2017 will also be more than Dion Lewis and James White make combined ($2,276,772). The $3.15 million cap hit is also three times the amount that the Patriots gave to Blount last season ($1,025,000) before he hit different incentives. The deal is interesting on multiple levels. At this price, it suggests that Burkhead is coming to the Patriots with a chance to be their starting running back. Burkhead could split time with Lewis as the Patriots lead back with White serving as the third-down back. With Blount still on the open market, it also suggests that the Patriots could possibly be done with the bruising running back, who led the NFL in rushing touchdowns last season. But with Burkhead signed for only one year, this doesn't give the Patriots much long-term depth at the running back position. At this point, Burkhead, White and Lewis will all be unrestricted free agents in 2018. That leaves the Patriots with only D.J. Foster signed beyond this season. It wouldn't be surprising to see the Patriots dip into the 2017 NFL Draft for a running back since that would give them a player at the position under contract for the next four years. As far as 2017 is concerned, the money suggests Burkhead could play a bigger role on the Patriots offense than we originally thought.